We are so glad you "stopped by"! Welcome to our new members! We are excited to share our TCARC 2019 upcoming collaborative literacy opportunities! Please see details below and check the website links for registration information or for additional details. Now accepting Celebrate Literacy Student Submissions! We are now accepting your top three student writing pieces! Entries are due March 29th and winners will be recognized at our Celebrate Literacy Young Author’s Recognition event on May 3rd. Join us at the 2019 MRA Summer Conference in July! Come join us at the 2019 MRA Summer Conference! MRA and TCARC will be sponsoring the July 16th and 17th days of Hamline's Summer Literacy Institute. The keynote speakers are Cornelius Minor (July 16 - MRA Day) and Jennifer Serravallo (July 17 - TCARC day). MRA members can register for the $150 one day rate on July 16 or 17 and included in that rate is a renewal for your annual MRA membership. Not an MRA member? You can choose to join if you attend July 16 or 17. Registration for the Heinemann One-Day Workshop is now open! Our students encounter our teaching every day. But how do we know what they are holding onto and learning? 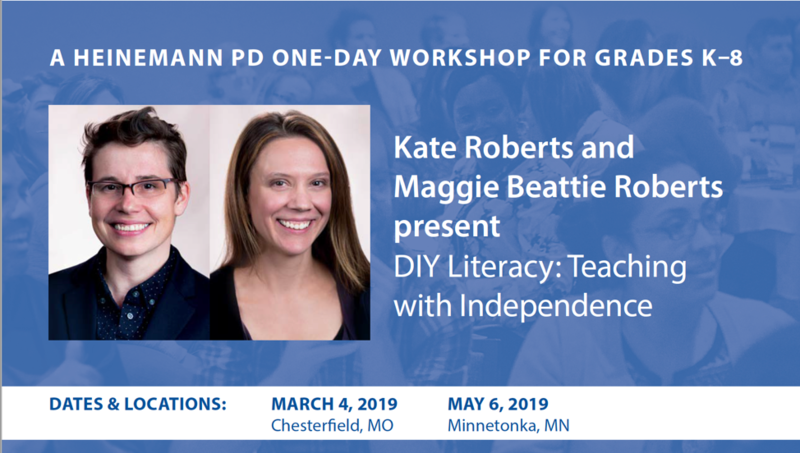 In this practical and interactive workshop, Kate Roberts and Maggie Beattie Roberts will help you get to know and create a variety of teaching tools that help your students reach new heights in their learning. Spread the Word about TCARC! Do you have a friend or colleague who is looking to expand or enrich their professional development opportunities and experiences? Would you like to get more involved with leadership opportunities with TCARC? Please contact us! Share your love of the Minnesota Reading Association and TCARC with colleagues! For more information please visit the Twin Cities Area Reading Council homepage. You can also follow us on Facebook and Twitter! Copyright © 2019 Twin Cities Area Reading Council. All rights reserved.